Want an easy way to get rid of that back hair? There are all sorts of trimmers out there to help you with your manscaping, but few of them make it easy to handle the hard-to-reach areas on your back. That’s a problem, as back hair ranks up there as one of the biggest turnoffs for women. We tried out the new MANGROOMER, and this do-it-yourself electric back hair shaver is incredibly easy to use. You can see the ingenious design from the photo about. 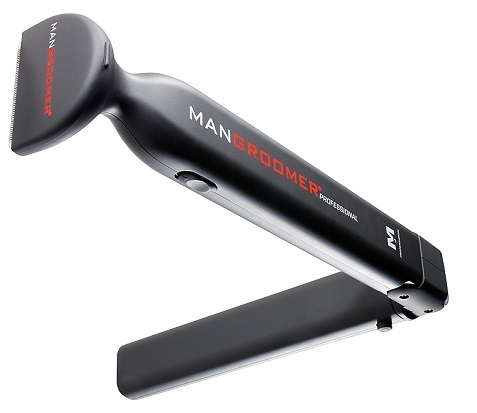 The MANGROOMER simply folds out to give you an easy tool that reaches every part of your back. Just reach around your side or over your shoulder and you’ll be shocked by how easy this is to use. It also feels good on the skin as it neatly trims off the hair on your back. With summer around the corner it’s time to get in shape, and now that also includes doing the little things to make you look better. Getting rid off that excess back hair will make you look much better, and now you have the tool to take care of it. Check out their website for more information on the MANGROOMER and other grooming products for guys, along with their Facebook page and Twitter account. What are your grooming habits?